Humans were designed for complex movements, in a variety of planes, in constant motion. Our bodies move freely through series of “tugs-of-war”. In order for movement to take place, one muscle group works as it’s opposite relaxes. For example, when you scratch your nose, your biceps work to bend your elbow while your triceps relax so the elbow can bend. To bring your hand back down, the roles reverse and the triceps work as the biceps relax. In a balanced, healthy body in motion, your “tugs-of-war” play fairly and no one get hurts. Unfortunately, if we don’t use our body correctly, as in poor posture, our “tugs-of-war” can work against us. Eventually, in all “tugs-of-war” there is a winner and a loser. 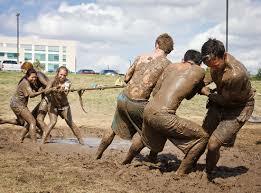 The losing team is the one that ends up hurt and screaming as a result of being dragged through the mud puddle. In this scenario, the losing team is in a state of “dis-ease”. Meanwhile, the winning team (or bullies) can’t wait to do it again and inflict more “dis-ease”. When we have good posture, the two teams play fair, each giving and taking to keep things balanced. The minute we go into our normal position as humans in today’s world, it’s easy for the bullies to take over and throw our “tug-of-war out of balance. Imbalances in our “tugs-of-war” can lead to “dis-ease” in our bodies. This “dis-ease” may have a more common name such as “low back pain”, “carpel tunnel” or “headaches”. 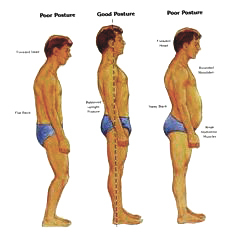 When we sit at a desk, or anywhere else for that matter, our posture suffers. 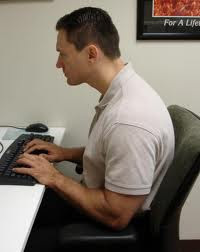 Our shoulders rotate in, our palms turn down, the head goes forward and our elbows resting on the desk or reaching for the mouse push our shoulders up around our ears. There are loads of big muscles that do all of these movements. There are smaller and fewer muscles that do the opposite of these movements. Once we find ourselves there the outcome of the “tug-of-war” is inevitable and the resultant “dis-ease” is also inevitable. When we first make repetitive movements, like sitting at a desk, it takes some muscular effort. After doing that movement for a while though, the body will adapt to the effort and enlist your connective tissue, or fascia, to hold you in the seated position. Muscle is ‘expensive’ for your body, whereas, fascia is cheap – so, given the option, your body will choose fascia to hold you in position. Seems smart and efficient right? The problem is that this fascia starts to take over and gets thick. Then when you try to straighten, the fascia makes it very difficult. Left alone, the fascia just keeps getting thicker and tighter in the position which you spend the most time. Seated at the computer! Does this sound bleak? It doesn’t have to be. Fascia’s primary job is to hold you in whatever pattern you tell it…. it only does what you tell it to do! If you start moving in another direction, your fascia has to respond. It will actually remold itself based on your new demands. Those demands could be new postural patterns and stretches. Stretching, when done properly and with intent, will make good posture something that is easy to attain. Lets look closer at the poor posture that desks seem to inflict on us, rounded shoulders, head forward and shoulders elevated and break them down. There are many muscles involved in all of these movements but we are going to pick on the captains of the bullies for these recommendations.To round your shoulders forward, your pectoralis minor is the main culprit. It attaches to your ribs in front and the front of your shoulder blade. Hence, when it shortens, your shoulders pull forward. To stretch it, turn your thumbs up and open your arms like you are going to hug a very tall person. Your hands should be higher than your shoulders. Now just squeeze your shoulder blades together opening your arms wider, hold for a two count, release and repeat 6 to 10 times. For your head to fall forward your tiny scalene muscles are the main offenders. They attach on your top two ribs and up in your neck vertebra, so when they shorten your head comes forward. If these get really tight they can have a negative affect on the space between your vertebras. To stretch them, you need to push your chin to the ceiling. If you feel this in the back of your neck then you have some joint space issues and should not do this stretch without some coaching. When the shoulders come up to the ears your upper trapezius is leading the way. It has an attachment along your shoulder blade and the other attachments are in the upper vertebra of your neck. When this muscle tightens the shoulders elevate. To stretch it, keep your chin level and centered then take one ear to the same shoulder, you will feel the stretch on the opposite side of the neck. 6 to 10 times on one side and then move to the other side. When these three muscles take over and the fascia thickens to hold the poor posture the nerves that feed the arm can get entrapped and poor signals to the hands can result. We believe this is a large contributor to carpel tunnel. By stretching the above three muscles and your wrists you may be able to keep it at bay or even eliminate it. In Part 2 of this article, we will look at how the lower body can be damaged by sitting at a desk.